The India-UAE Partnership Summit (IUPS) taking place in Dubai next month will target large-scale projects, while also focusing on education and SME sectors. The two-day summit, being organised by Business Leaders Forum (BLF), kicks off at the Atlantis Hotel on October 30. Indian economy, which registered 8.2 percent growth in the first quarter of 2018-19 fiscal year is expected to attract large-scale investment from the GCC, following the recent announcement of the development of a $44 billion oil refinery to be built by Abu Dhabi National Oil Company (Adnoc), Saudi Aramco and Indian counterparts. The announcement comes a few months after Emirates Group announced a $4.23 billion aircraft maintenance, repair and overhaul (MRO) project in Andhra Pradesh in February this year. Meanwhile, the BLF has signed a memorandum of understanding (MoU) with the Andhra Pradesh state government to develop two islands and build a mixed-use master-planned community with an 18-hole championship golf course, a luxury resort, a villa community, residential and commercial properties where people could live, work and enjoy quality of life. The project will be spread across a landmass of 500 acres split into two islands to be connected with a bridge on Amravati River with an investment outlay of Rupees 100 billion ($1.41 billion), said officials. Although these projects will take years to take shape, they reflect a growing investment appetite by Gulf investors into India’s growing economy, they said. “We are delighted to support the 2nd IUPS being organised by BLF. Its objectives and agenda fit perfectly into our own efforts to promote the strategic partnership between India and UAE,” Navdeep Singh Suri, Ambassador of India to the UAE, said. “I am confident that this summit will be an important step in encouraging investments into specific sectors and projects being promoted by the participating states,” he said. Foreign Direct Investment (FDI) in India increased to $61.96 billion in 2017-18, according to Indian Government’s Department of Industrial Policy and Promotion (DIPP). Juma Al Kait, Assistant Under-secretary of the UAE Ministry of Economy, said: “The India-UAE Partnership Summit (IUPS) provides a unique platform to highlight investment potentials in India and the UAE and create awareness among investors, about these opportunities. 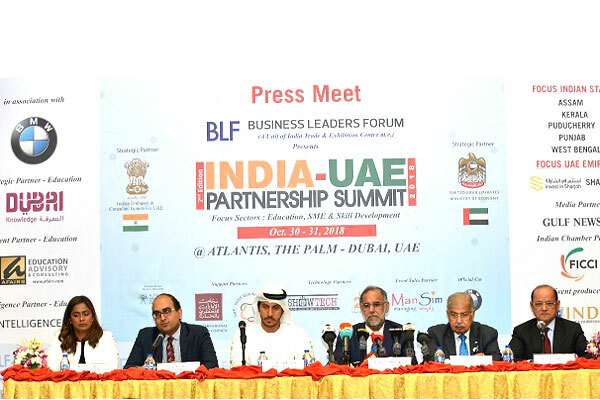 Vipul, Consul General of India, said: “I am happy that the second edition of the India-UAE Partnership Summit (IUPS) is being organized by BLF this year in partnership with the Consulate. BLF did a good job in not treating the IUPS as a standalone meeting but following up on the discussions at the first IUPS in the past 12 months. “They maintained touch, for example, with the Government of Andhra Pradesh and also signed an MoU with them and also kept meeting delegations from other States and Ministries visiting UAE. This year the IUPS is focusing on the two important sectors of education and SMEs. I am happy that at least four Indian States have already confirmed their participation in the Summit. Dr Ram Buxani, president of the BLF, said: “We are witnessing a new era in the economic growth of India as well as the India-UAE relationship and investment landscape marked by high-level strategic cooperation. Sudesh Aggarwal, board member of the BLF, chairman of the IUPS Organising Committee and chairman of India Trade and Exhibition Centre (ITEC), said: “Last year, we announced the creation of an Emirati Investors’ Group to generate funds for investing in state-sponsored big-ticket projects that will be offered to us by invitation only and we also said that we will be investing $1 billion. “Today I am proud to announce that we have raised the investment outlay to exceed $1.41 billion in a major project in India – which sets a benchmark for such large-scale club investment by members of a business community. The UAE is the 10th largest FDI source market for India with cumulative FDI reaching $4.76 billion in the last 17 years from April 2000 till March 2017. Invest India, the foreign investment promotion body of India, said it will attract $100 billion foreign investment in the country, of which $85 billion has already been committed by 600 large businesses that will create 700,000 jobs, according to recent reports. The high-powered IUPS is split into a number of brainstorming business sessions and panel discussions on hot topics, while ministers of five Indian states – Andhra Pradesh, Assam, Kerala, Puducherry, Punjab and West Bengal – will present investment opportunities in key projects within the states and seek investment from potential partners in the UAE. Sripriyaa Kumaria, secretary-general of BLF and director-general of ITEC, said: “We are pleased to welcome the emirates of Abu Dhabi and Sharjah in partnering with us at this prestigious event that will help us to gradually bring all the states of India and the UAE closer and create a state-to-state cooperation platform, in addition to the G2G and B2B platforms – which will take the relationship of the two countries to a completely different level. “I am glad to announce that IUPS 2018 will feature six major focus states and will be represented by a high-level delegation of ministers and senior officials. Andhra Pradesh, Assam, Kerala, Puducherry, Punjab and West Bengal shall showcase sector-specific investment opportunities from their states.